How do people discover your products? Yes, there’s things like Pinterest and Twitter and banner ads and content marketing, and best practices surrounding each strategy. But you might be surprised to learn that how your products are classified is a key factor in product discovery as well. We understand if “product classification” doesn’t sound like a topic you want to get intimately familiar with. But in this post, we’ll walk you through product classification in practice, show how retailers are revamping this process for better product discovery on their websites, and hopefully convince you that classification is a crucial - and compelling - part of ecommerce. A number of different retailer websites have begun carrying your brand’s newest bag – “The Diana Everyday Bucket Bag.” It’s a turquoise cotton bag that’s as functional for date nights as it is for a day at the beach. One retailer doesn’t sell very many bags on its website, so any bag is either categorized as a “handbag” or a “backpack.” Your bag is a handbag. Another retailer sells a much larger assortment of bags, but first, a visitor must decide if he or she wants to dive into the “men’s” or “women’s” category. From there, the visitor must scroll past all the apparel categories to find the category labeled “accessories” and then the subcategory labeled “bags.” This category is further subdivided into no fewer than ten categories of bag types. You must select “shoulder bags,” then “daytime” to finally get to the page with your bag. The scenario above highlights several real product discovery challenges that retailers are working through today. To “stumble upon” your bag, customers must embark on a different path depending upon which retailer’s site they’re on. (The path on the first retailer website, for example, is “Bags > Handbags.” The path on the second retailer website is “Women’s > Accessories > Bags > Shoulder Bags > Daytime.”) This variation inevitably means that some sites are going to provide better paths to discovery for any given customer than other sites. How can a retailer optimize a customer’s chances of discovering your bag via a variety of search terms and without compromising the hipster-chic appeal of their website? One of the biggest initiatives to address the classification challenge is the Structured Commerce Classification. Some of the biggest retailers in the world have teamed up with an organization called GS1 and have been hard at work developing a common standard for classifying products that will soon start significantly affecting how they ask you for information. What will an SCC world look like? Well, not only will customers more reliably find your product quickly on any retailer’s site, but you'll also have a common standard for sharing product information across retail partners. What does this mean? 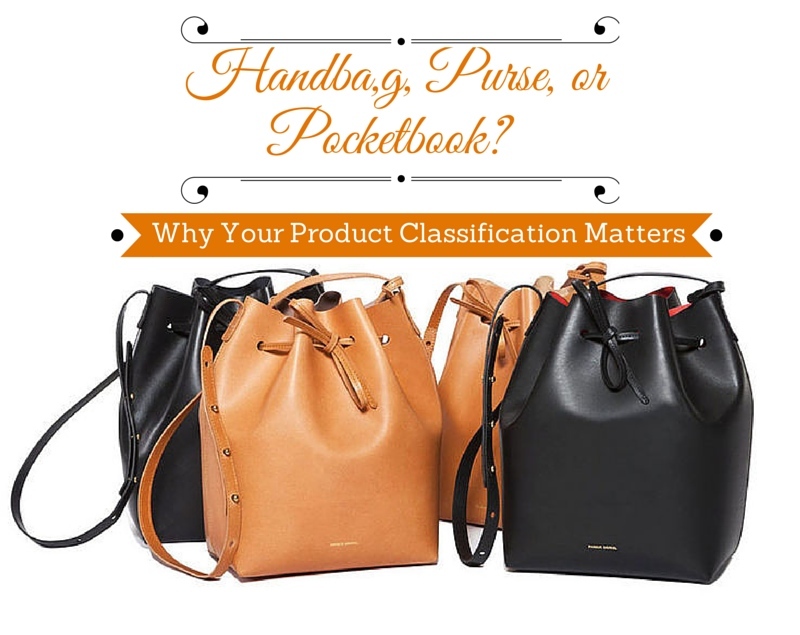 Even if your three different retailers label your bag as a handbag, daytime shoulder bag and pocketbook on their sites, you'll send a common set of information to each retailer based on which SCC category your product falls into and let them deal with slotting in the information as they please. A higher instance of sales, a lower expenditure on exchanging product information. Sounds good, doesn’t it? Though the SCC hasn’t formally launched yet, there’s tidbits of information available on the Internet - like this video and this publicly shared presentation - that can help get you oriented with the goals of the SCC and how it thinks about the future of product classification. As you continue to build rich marketing campaigns that drive Internet users to your site, make sure that you also start considering how classification affects product discovery on retailer websites, as well as your own. Make sure to also keep the Structured Commerce Classification on your radar, and analyze whether your company is ready to shake up how you think about your products.